Are you a woman obsessed with her haircare tools, be it a hairdryer, curlers, rollers or hair-straighteners? If you are, you are like the vast majority of women I know who dearly love theirs. Unlike all you Hair Glamazons until recently I remained a simple girl at heart, using a hairdryer on occasion, when I just simply couldn’t wait for my hair to dry-up naturally but a blow-dry and a chat with hairdresser Errol Douglas put an end to my hair-gadget-free existence for good. 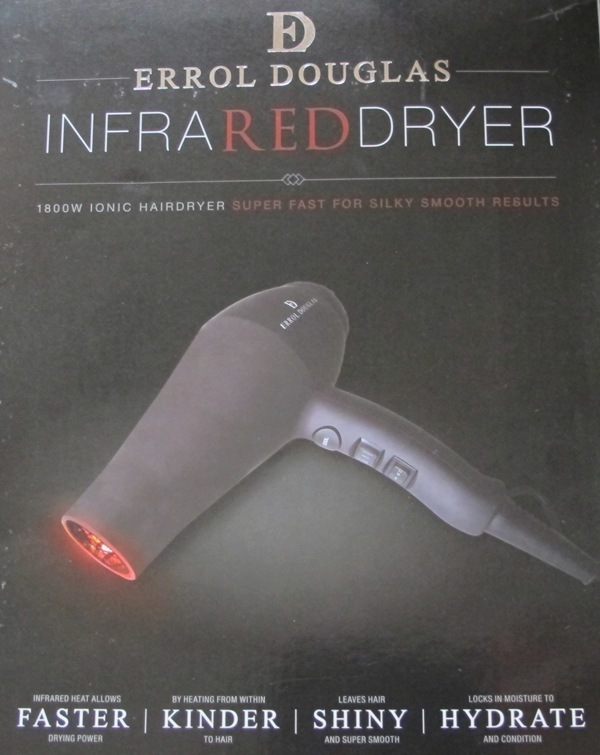 A couple of months ago I got to try Errol Douglas INFRARED DRYER and have to say that it is the coolest hair-dryer that I have had a pleasure of using at home. It combines the benefits of infrared light, anti static and Ionic technology to deliver speed, shine and a frizz-free finish ( one of my best friends, who hated her hair because of its frizz now grins like a cheshire cat when this dryer is mentioned ). According to the press release ‘Infrared light is known to penetrate the hair for more accelerated drying, aid d circulation and reduce hair loss, whilst Ionic technology allows moisture to penetrate and rehydrate the hair. The anti-static technology finishes the combination by delivering a frizz-free finish on super smooth hair. Errol is adamant that “We’re all short on time, but it’s important that this doesn’t make the hair condition vulnerable to harsh drying processes in the daily race to get out the door. I wanted a dryer that combined that reduction in drying time with a unique combination of protective technology for a healthy, sleek finish”. The hair-dryer itself looks big and sleek enough, like the exact replica of the ones you see in the hair salons but this one, even though simple enough to operate, makes you feel like a hair-tech-geek, when you look at the buttons or switch it on. There is Led Ionic light, an infrared integrated light ( it speeds up the drying process ), the cold shot button ( you turn it on just before you finish drying your hair-the same principle applies when you finish washing your hair with a cold water blast to close the hair shaft ), temperature ( 3 heat settings ), as well as speed settings ( there are two ). Another bonus is a airflow nozzle and a long cord, as many home hair-dryers, let alone hotel ones, have annoyingly short ones, making them look like a dog on a short leash, which you cruelly have to tag. You can also use this hairdryer on your kids, without worrying of damaging their hair and if anything, you might get a title of a cool mum even from a demanding teen, as this hair-dryer is indeed cool. Since I started using this dryer I actually noticed that my hair looks slightly shinier, even when I don’t use the hair oil on it. So there you have it, a confession of a hair virgin-this InfraRedDryer has become my indispensable tool and I love it ( all Errol now has to do is create a mini version for travel, as I find it annoying not to have this hair gizmo with me in a suitcase ). The Errol Douglas INFRARED DRYER ( RRP £59.99 ) and TREAT & STYLE and are available in Boots Stores nationwide.